An Introduction to Computer Science, 3rd Ed. This book is designed to be used as a primary textbook in a college-level first course in computing. It takes a fairly traditional approach, emphasizing problem solving, design, and programming as the core skills of computer science. However, these ideas are illustrated using a non-traditional language, namely Python. This textbook was written with a single overarching goal: to introduce fundamental computer science concepts as simply as possible without being simplistic. Using Python is central to this goal. Traditional systems languages such as C++, Ada, and Java evolved to solve problems in large-scale programming, where the primary emphasis is on structure and discipline. They were not designed to make writing small- or medium-scale programs easy. The recent rise in popularity of scripting (sometimes called agile) languages, such as Python, suggests an alternative approach. Python is very flexible and makes experimentation easy. Solutions to simple problems are simply and elegantly expressed. Python provides a great laboratory for the neophyte programmer. Python has a number of features that make it a near-perfect choice as a first programming language. The basic structures are simple, clean, and well designed, which allows students to focus on the primary skills of algorithmic thinking and program design without getting bogged down in arcane language details. Concepts learned in Python carry over directly to subsequent study of systems languages such as C++ and Java. But Python is not a toy language. It is a real-world production language that is freely available for virtually every programming platform and comes standard with its own easy-to-use integrated programming environment. The best part is that Python makes learning to program fun again. 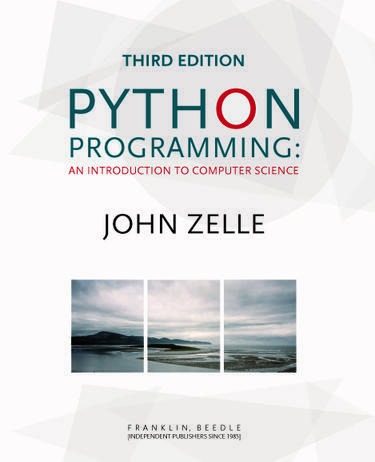 The third edition continues the tradition of updating the text to reflect new technologies while maintaining a time-tested approach to teaching introductory computer science. An important change to this edition is the removal of most uses of eval and the addition of a discussion of its dangers. In our increasingly connected world, its never too early to begin considering computer security issues. Several new graphics examples, developed throughout chapters 412, have been added to introduce new features of the graphics library that support animations, including simple video game development. This brings the text up to date with the types of final projects that are often assigned in modern introductory classes. Material on file dialogs has been added in Chapter 5. Chapter 6 has been expanded and reorganized to emphasize value-returning functions. Coverage has been streamlined and simplified to use IDLE (the standard comes-with-Python development environment) consistently. This makes the text more suitable for self-study as well as for use as a classroom textbook. Technology references have been updated. To further accommodate self-studiers, end-of-chapter solutions for this third edition will be freely available online. Classroom instructors wishing to use alternative exercises can request those from the publisher. Self-studiers and instructors alike will be able to visit this website to download the solutions.